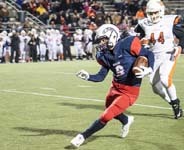 DAWSON TOUCHDOWN - Dawson running back Saevion Johnson (3) scored three times against La Porte on runs of 57, 6, and 13-yards as the Eagles won their Class 6A Region III Div. II playoff opener 35-28 against the La Porte Bulldogs. Johnson had 15 carries for 145 yards and three scores. PEARLAND — There is one fundamental speech that Dawson head coach Eric Wells and his coaching staff shares with their players and that is to play 48 minutes in every game. When the Eagles faced the La Porte Bulldogs in the opening round of the Class 6A Region Div. II playoffs, they found out that the message they had been hearing was true. With :28 seconds remaining in the game, the Eagles could take a deep breath that the win was in hand. The game appeared to be a blowout as Dawson built a 28-0 lead early in the third quarter. The first half belonged completely to the Eagles as the ground attack was dominating on offense and the defense was keeping La Porte out of the end zone. After forcing La Porte to punt on their first possession of the game, the Eagles offense didn't waste any time getting on the scoreboard as running back Saevion Johnson found a huge hole in the Bulldog defense and used his speed to scorch the secondary to score on Dawson's first play of the game. La Porte was going to find out early that the Eagles game-plan was to literally run them in the ground. Leading 7-0, the Eagles struck again. This time it was the swift feet of running back Brett Winnegan who burned La Porte again for a 62-yard scoring jaunt giving the Eagles a 14-0 lead at the end of the first quarter. Johnson would get the call again with 1:13 left in the second period on a 6-yard scoring dash. Tyler Day booted his third PAT giving the Eagles a 21-0 advantage which would stand up at intermission. Dawson continued the same scoring pattern as Johnson registered his third score of the game with 9:16 left in the third quarter. This time he covered 13-yards for the touchdown and Day nailed the PAT giving the Eagles a comfortable 28-0 lead. That's when the Bulldogs finally woke up and the second half would turn into a real game. With 2:39 left in the third, La Porte finally got on the scoreboard when David Terrebonne caught an 8-yard pass from Austin Upshaw to close the gap to 28-7. That's when the momentum changed and La Porte saw a ray of hope. On the final play of the third quarter, La Porte moved closer as Upshaw scored on a 2-yard QB keeper to now make the score 28-14. Dawson answered as Winnegan got loose again to score on a sensational 47-yard jaunt to put some distance from the Bulldogs 35-14. With less than four minutes to go in the game, La Porte still wasn't going to give up as Nathan Redd scored on a 17-yard run with 3:16 left in the game making the score 35-21. Upshaw put the Bulldogs even closer with only :33 seconds left in the game when he scored on a 5-yard keeper making the score 35-28. But Dawson was able to breath a little easier after recovering the on-side kick to seal the win. La Porte was led by Redd who had 186 yards rushing on 12 carries and Upshaw who added 105 yards on the ground. But the Bulldogs couldn't stop the dynamic trio of Johnson, Winnegan, and QB Vance Galloway who posted 145, 151, and 140 yards respectively on the ground. Overall, the Eagles had 461 rushing yards on 51 carries and five touchdowns. Galloway was 4-for-7 passing for 62 yards. Ever since Dawson began playing in the playoffs, the Eagles have never lost a first or second round contest. They have always advanced to at least the third round since 2009. The Eagles (7-4) will be tested against former district rival Friendswood (8-3) on Saturday, November 22 at 2:30 p.m. at Rice Stadium. The Mustangs pulled out a miraculous overtime victory against the Hightower Hurricanes 35-29.